“In order for us to continue serving our customers efficiently we have to upgrade our equipment regularly. 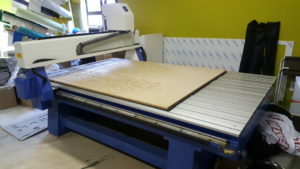 This state of the art CNC router cuts all shapes and letters that are made of aluminium, dibond , wood, perspex, mild steel, and many other forms of signage materials. This type of equipment allows us to maintain a flexible pricing structure in order to keep our prices low without compromising quality.” These are the words of SAKIPRINT’s acting Managing Director Saki Mabhele, at the launch of their brand new range of signage cutting equipment. SAKIPRINT has been in the industry for over 5 years specialising in various signage solutions.